Education for Rural People: Conference "Building Skills for Work and Life"
The activity took place as part of the Third International Congress on Technical and Vocational Education and Training (TVET) Building Skills for Work and Life organized by INRULED and UNESCO. INRULED also launched the flagship “Skills Development for Rural Transformation/ Skills for All” as complementary to the FAO-led ERP partnership. The Congress was hosted by the Government of the People’s Republic of China in Shanghai from 13 to 16 May 2012. The Congress was organized by UNESCO in response to the strong desire expressed by Member States for a global forum on TVET, at a time when skills have become a leading policy concern. 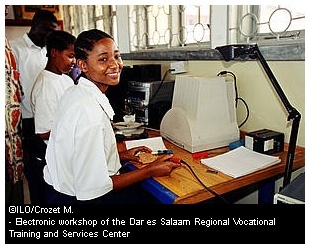 It charted strategic directions for transforming and expanding TVET to ensure that all young people and adults can develop the skills they require for work and life. Congress participants included a wide range of stakeholders, among them Member State ministries of education and training, labour, finance and health; the formal and informal private sector; employee organizations and youth. The ERP coordinator presented the ERP Partnership and the FAO policy on agricultural TVET, as an aspect of the CD Corporate Strategy. ERP focused on how the rural world is changing rapidly, and young people need to be prepared to seize new opportunities. Agriculture is also changing, with new technologies, products, markets and business environments. Moreover, many rural people will need to become engaged in non-farm activities or migrate to urban areas. To seize these opportunities, all will need skills that differ from those of their parents — and education and training systems need to face the challenge. The book “Education and Training for Rural Transformation; Skills, Jobs, Food and Green Future to Combat Poverty” co-published by UNESCO, the Beijing University and INRULED was the only official publication and substantive normative document produced by the Congress and was distributed to the 800 delegates of the UNESCO member countries. The FAO-led ERP work, has significantly contributed to shaping the Conference book, which quotes FAO work more than 20 times, and, specifically, the ERP publications 12 times. The book draws significantly from the FAO books "Education for Rural People. The role of education, training and capacity development in poverty reduction and food security" (D. Acker and L. Gasperini, 2009) and "Education for rural development. Towards new policy responses" (D. Atchoarena and L. Gasperini, 2003). As Prof. Manzoor - the book’s main author - highlighted, the publication is an indicator of the success of knowledge exchange and cooperation between FAO and INRULED-UNESCO in favor of food security and rural transformation. The book devotes a chapter to the FAO-led Education for Rural People Partnerships and the main research findings of the ERP partnership. The ERP coordinator was one of the peer reviewers of the Congress Output Document “Report on Current Issues and Trends in Technical and Vocational Education and Training (TVET). FAO requested changes to place a greater emphasis on agriculture education, rural people’s training needs and capacity and skills development, as well as on non formal training, including extension. Several chiefs of delegations, especially from the developing countries, highlighted that FAO brought the right balance to the Congress policy approach, since the rural population skills development needs had been sidetracked and they felt that the UNESCO report was speaking more to the developed - urban and industrialized - world rather than to them, despite the fact they represent the majority of the people of the world. Session 2: Skills development for rural transformation in conjunction with the launching of INRULED 2011 publication: “Education and Training for Rural Transformation” and INRULED Flagship Initiative: "Skills Development for Rural Transformation/Skills for All". This session analyzed the links between education, skills development and rural transformation. It explored the inexorable forces of change rural communities face and how education, by equipping people with appropriate knowledge and skills and fostering values of human dignity, can expand their choices and capabilities to exercise these choices. Prof Zhou Nanzhao, President UNESCO Asia-Pacific Network for International Education and Values Education (APNIEVE ) and Advisor, UNESCO International Research and Training Centre for Rural Education (INRULED), People’s Republic of China H.E. "Good practices on skills development "
"Constructing a rural transformation index "
"Better skills, better jobs, better lives: a strategic approach to rural transformation"
"Skills and capacity development for food security and poverty reduction "
"The Chinese rural TVET system and its role in bringing up vocational farmers "
"The INRULED initiative on skills training for rural transformation"